General surgery residency training has undergone significant changes in recent years, resulting in part from increased resident duty-hour restrictions and mandated attending supervision in the operating room, which ostensibly stem from concerns regarding patient safety. However, the mandate to train future generations of surgeons remains, thus creating an inherent tension between patient safety and opportunities for resident autonomy and independent decision making. In this issue of JAMA Surgery, Siam et al1 present the outcomes of appendectomies performed at their institution in the period before and after mandated attending presence at all operations. The authors are to be congratulated for taking advantage of this natural experiment to examine the influence of resident independence on patient outcomes. 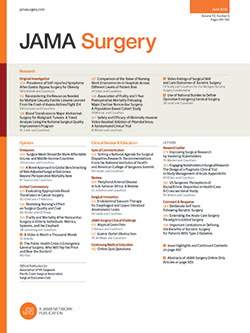 They found no significant difference in patient morbidity or mortality and no difference in markers of decision making, such as preoperative tests ordered or time from emergency department to operating room, when a general surgery resident worked independently or under the supervision of an attending surgeon. The only significant difference was in operative time, with residents operating independently requiring a mean of almost 9 more minutes to complete the operation than when an attending surgeon was present.